If Candy Crush has taught us something, it’s how sugary treats can make us feel happy and energized. Isn’t sugar the reason why we crave for chocolate or ice-cream whenever we’re feeling down? A new study proves though that this long-lasting myth couldn’t be further from the truth. The University of Warwick, Humboldt University of Berlin, and Lancaster University came to a conclusion that sugar makes you more tired and less alert, not the other way around. The research team used extensive data collected from more than 30 studies and looked at various factors, including the quantity and type of sugar. They found that eating sugar-rich treats actually has no effect on your mood, no matter the amount. After eating sugar, people actually felt more tired. This means that consuming sugary treats won’t give you the much-debated sugar rush – it’s just a myth with no scientific backing. “The idea that sugar can improve mood has been widely influential in popular culture, so much so that people all over the world consume sugary drinks to become more alert or combat fatigue. If anything, sugar will probably make you feel worse,” said Dr. Konstantinos Mantantzis who also led the study. You might think it’s okay to grab a bag of gummy bears for a movie night, eat a few candy bars or keep a never-ending supply of ice-cream in your fridge, but eating too much sugar can do a lot more harm than just make you feel tired. An extensive 15-year study published in 2014 showed that those who received about 20% of their calories from added sugar had a 38% higher risk of developing heart disease (and dying from it) than those who just consumed about 8% of their calories as added sugar. What’s worse, it’s known that an average American consumes an astounding 17.4 teaspoons of sugar every day. 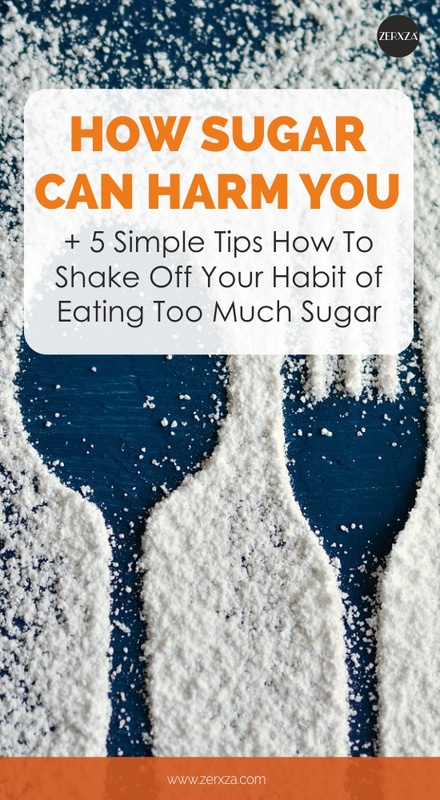 One teaspoon of sugar is about 4 grams which means that on average, Americans exceed the recommended intake limit of 25 grams almost by 3 times. Sugar is metabolized straight into fat, so a sugar-rich diet can increase the body’s overall fat content that contributes to a number of health issues, including fatty liver disease which contributes to diabetes. What’s interesting is that sugar is actually metabolized similarly to alcohol. Consuming too much sugar puts too much strain on your liver that needs to work on that excessive sugar, leading to potential liver damage, similarly as it would happen when drinking too much alcohol. Beyond that, high sugar consumption can lead to insulin resistance, high cholesterol, high blood pressure, weight gain, and even kidney disease. It’s also more than possible that sugar can lead to food addiction – or in this case, sugar addiction – which can put you in a mentally unstable condition and expose similar issues as those with drug addiction have. Making dietary changes is definitely not easy, especially when you need to limit sugar consumption. However, sugar is the one thing that many Americans overlook since it seems harmless enough. A vast pool of studies and scientific facts prove otherwise and it’s clear that steering away from sugar is the right way to go. It might literally save your life. But how much sugar could you eat per day? Going completely sugar-free might not be an option either since it poses its own set of issues. The key is practicing moderation. Dr. Robert Lustig recommends consuming no more than 6 teaspoons of added sugar. As a general rule, you should stay under 25 grams of fructose per day and that includes both added sugar – the one in processed foods – and fruits. Experts also recommend steering away from artificial sweeteners (like aspartame) since these might be even worse than sugar due to various health issues. Natural sugar itself is not bad – what’s bad is consuming it excessively. If you like drinking coffee with sugar, decrease the sugar amount you put in your coffee. If you’re used to adding 2 teaspoons of sugar in your coffee, start using just 1 teaspoon. Drink more water, not sodas or fruit juice which both tend to contain excessive amounts of sugar. Eat healthy fats. Instead of filling your body with fats that have been metabolized from sugar, opt for healthy fats such as omega-3. Olive oil, nuts, avocados, and salmon are all great options to include in your daily diet. Don’t go crazy with cutting back sugar. If you cut back very suddenly, your sweet tooth might influence you into consuming other unhealthy foods such as refined starches or very carbohydrate-rich foods such as breakfast cereals. Even worse, you might find yourself consuming foods high in fat such as fast food. If you find yourself struggling with cravings, you need to practice self-control as it’s the best way to avoid yourself from opting for even worse food items than sugary treats. Read food labels very carefully. You might think you’re consuming far less sugar than you actually are since even the most harmless-looking food items such as ready-made sauces, ketchup and others might contain a lot of sugar. Remember, sugar itself isn’t inherently bad and a little bit of sugar is okay. Keep track of your sugar consumption and if necessary, cut back a bit to avoid being haunted by several nasty health issues that might arise from consuming too much sugar.